In the first place, it’s probably the deep rich colour of Kwila, used on the Currumbin High Back Kwila Outdoor Timber Setting tops, which lures you to be seated. This outdoor set comprises a generously sized table L: 1800mm W: 1100mm coupled with four high back benches. There’s not a lot going on with the benches, because there’s only four of them and they don’t get messy around the table, yet they still seat ten. Cosy outdoor get togethers can be easily achieved because the solid high back benches really do allow guests to sit back and relax. 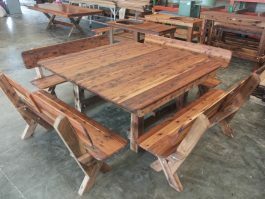 This Palm Beach Slat Back Cypress Outdoor timber Setting looks great poolside or on a verandah for outdoor entertaining. Enjoy an evening dining outdoors with eight guests around a Palm Beach Slat Back Cypress Outdoor Timber Setting SL. Your guests will feel comfortable and relaxed. 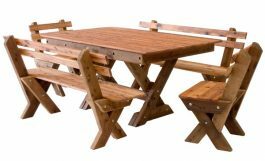 The Palm Beach High Back Cypress Outdoor Timber Setting consists of a practical sized table L: 1600mm W: 1000mm and four high back benches that are angled just right for comfort. 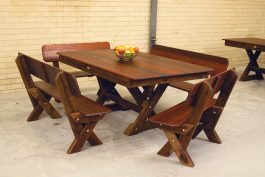 Palm Beach High Back Cypress Outdoor Timber Setting is manufactured completely in Cypress timber and suitable for outdoor use year round. Surrounding the table are four hard wearing solid benches that between them, make up a Palm Beach High Back Kwila Outdoor Timber Setting suitable for outdoor use throughout the year in fact. Because the benches are detached, you thereby have the advantage to use them for extra seating elsewhere in your outdoor living space. In other words, you can benefit by making more than one matching outdoor seating area in your home. Maybe even more reason to get out and enjoy the outdoors! Palm Beach High Back Kwila Outdoor Timber Setting consists of 1 x Palm Beach Kwila Outdoor Timber Table, 2 x 3 Seat High Back Kwila Outdoor Timber Bench and 2 x Single Seat High Back Kwila Outdoor Timber Bench. Enjoy the easy, breezy character of the Southport 1600 Backless Cypress Outdoor Timber Setting as it’s probably one of the most chilled out sets we make. You can sub out the backless benches for our slat back benches or have a combination of both styles – works out the same cost! If you are searching for a setting that is versatile and suitable for outdoors, then we think you’ve found it with the Southport 1600 Slat Back Cypress Outdoor Timber Setting! Whether you’re placing it on a deck, in the midst of your garden or poolside, we are confident you will be thrilled with the rustic styling and comfortable nature of this gorgeous setting. At an impressive 1600 by 1600mm square, the Southport 1600 High Back Cypress Outdoor Timber Setting is perfect for hosting parties of 12 people. The high back benches let the table speak for itself, and they are a popular seating choice; with simple lines, supportive high back and they enable more guests to be seated around the table than individual chairs. 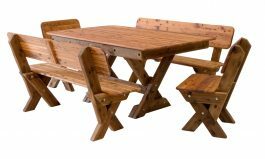 The Southport 1600 High Back Kwila Outdoor Timber Setting is designed for outdoors with durable tops crafted from Kwila timber. Able to seat up to 12 people, the table’s square shape is great for creating a fun, communal setting where everyone can join in the conversation.